The Vail Store and Post Office was the hub of communication and commerce for an area stretching from the Rincon Valley in the north to the Santa Rita Mountains to the south. Correspondence was welcomed equally by well-to do ranch owners and railroad section hands. Homesteaders, miners, wranglers and teamsters, they all crossed paths at the Vail Store and Post Office. Built in 1908, the walls of this humble adobe have echoed with joy, sorrow and laughter when a beer or a stiff shot of whisky hit the long wooden bar. In the early days confrontations sometimes ended in a gunshot. The smell of fresh hay, lathered horses and oiled leather was taken for granted when the Tucson to Helvetia Stage made its regular stop at the west end of the building to change horses. Mexican and Yaqui families escaping unrest in Mexico stopped by in hopes of hearing where work could be found, to purchase some canned goods, or if they were very fortunate, pick up a letter from loved ones. By the late 1910s travelers could fill up the gasoline tanks on their new-fangled motor cars that were now traveling over the Old Wagon Road that passed by the building. During the 1930s the boys of the local Civilian Conservation Corp camp stopped in to pick up their mail and exchange gossip. Many tears were shed when a telegraph arrived saying that Private Bernardino Estrada, son of Mt. Fagan homesteader Francisco Estrada, wouldn’t be coming home. The call announcing the elopement of Jack Herman and Jane Dillon came first to the Vail Store and Post Office. Whatever happened anywhere in the area it was probably discussed over the counter at the Old Vail Post Office. According to Frances Schmidt Sundt, “The Post Office was the hub of the community. We went to the post office just to find out what was going on. After all, you had to know what your neighbors were doing!” Frances grew up at Colossal Cave and picked up her mail in Vail. “The Old Vail Post Office is a physical reminder of the national economic and cultural forces that converged at Vail in the late 19th and early 20th century. All other traces of Vail’s railroad, mining and ranching roots at the original town site are gone; erased by time, population growth, and development.” Located along the main road that passes through Vail this humble adobe is a reminder of Territorial Arizona and the daily struggles of those that made a life there. It is a sharp visual contrast to the perfectly manicured image promoted by a modern, developing Vail. Gorski, Andrew. Condition Assessment Report. Pima County Cultural Resource Office. 2005. Words reach across the years to reveal the isolation and grinding labor it took to build a life in the Arizona Territory. Letters and packages were the physical link connecting those who had come west to find a new life and establish Arizona as a future state, with the communities and families they had left behind. A letter, carefully crafted, stamped and carried to the post office was entrusted to the local postmaster and sent on its long journey. It might be weeks or even months before an answer was received. How dear each treasured word of the reply would be when it finally arrived! Letters were read and re-read, held to the heart, tied with a ribbon or string and kept in a bureau drawer or chest waiting for a new generation to discover. They provide a glimpse of life when Vail was a young community in the Arizona Territory. The walls of this humble adobe have echoed with joy, sorrow and laughter when a beer or a stiff shot of whisky hit the long wooden bar. In the early days confrontations sometimes ended in a gunshot. The smell of fresh hay, lathered horses and oiled leather was taken for granted when the Tucson to Helvetia Stage made its regular stop at the west end of the building to change horses. Mexican and Yaqui families escaping unrest in Mexico stopped by in hopes of hearing where work could be found, to purchase some canned goods, or if they were very fortunate, pick up a letter from loved ones. By the late 1910s travelers could fill up the gasoline tanks on their new-fangled motor cars that were now traveling over the Old Wagon Road that passed by the building. During the 1930s the boys of the local Civilian Conservation Corp camp stopped in to pick up their mail and exchange gossip. Many tears were shed when a telegraph arrived saying that Private Bernardino Estrada, son of Mt. Fagan homesteader Francisco Estrada, wouldn’t be coming home. The call announcing the elopement of Jack Herman and Jane Dillon came first to the Vail Store and Post Office. Whatever happened anywhere in the area it was probably discussed over the counter at the Old Vail Post Office. According to Frances Schmidt Sundt, “The Post Office was the hub of the community. We went to the post office just to find out what was going on. After all, you had to know what your neighbors were doing!” Frances grew up at Colossal Cave and picked up her mail in Vail. “The Old Vail Post Office is a physical reminder of the national economic and cultural forces that converged at Vail in the late 19th and early 20th century. All other traces of Vail’s railroad, mining and ranching roots at the original town site are gone; erased by time, population growth, and development .” Located along the main road that passes through Vail this humble adobe is a reminder of Territorial Arizona and the daily struggles of those that made a life there. It is a sharp visual contrast to the perfectly manicured image promoted by a modern, developing Vail. Vail and other railroad stops like Esmond to the west and Irene, Pantano, and Benson to the east were a local response to the expansion of the United States population westward. Empty space is not easily controlled or held. The Railroad and Homestead Acts of 1862 were written with this in mind. Individuals and families seeking to become landowners and improve their social station pushed westward by wagon and on the rails of the Southern Pacific Railroad (SPRR) providing a presence on the land . Vail’s siding is part of this story. It appears as early as 1883 on George Roskruge’s Pima County map . Vail gets its name from Walter Vail, rancher and businessman. Walter worked to build the Empire Ranch located at the headwaters of Cienega Creek. It was one of the most important ranches in southeastern Arizona. It was Walter and another business partner, J.S. Vosberg , who deeded a right-of-way to the Southern Pacific Railroad in 1880 and again in 1888. A siding track built alongside the main line would provide a means for east-west trains to safely pass. The siding that would come to bear the Vail name was along the old immigrant wagon road. It was a place where the railroad, homesteading, mining, and ranching drew those seeking a better life. Until about 1895, the population at Vail’s siding hovered around 25, mostly SPRR employees. By 1900, the population had grown to nearly 150 in the surrounding area. Walter and his brother Edward conducted business from multiple locations including Total Wreck, Rosemont, Tucson, Vail’s siding and the town of Pantano where Walter served for a time as Postmaster . An Eagle Milling receipt dated 1900 for flour to be delivered to Vail’s station signed by Edward Vail speaks to their business interests in Vail. A second easement was deeded by Walter Vail and J. Vosberg in 1887 when the Southern Pacific relocated the entire section of track between Vail’s siding and the town of Pantano bringing the rails out of the Cienega Creek bed. The agreement between the SPRR and Vail and Vosberg stipulated that the Southern Pacific Railroad would build a wooden board-and-batten style building to be used for commerce in the town of Pantano. They negotiated a rent of $5.00 annually. The SPRR was also required to build a cattle corral that would hold 20 boxcars of cattle . The Southern Pacific was given 60 days to complete the projects at their own expense. It is very likely that the same arrangement was made for Vail’s siding in 1887. According to local tradition, the Vail Store and Post Office was constructed around 1890 for the Vail brothers. This collective memory may reflect the origins of the original wooden board and batten Vail Store and Post Office building. The Last Flat Piece of Land… Vail’s siding. The steady clang of sledgehammers wielded by almost 500 Chinese Southern Pacific Railroad workers striking iron spikes split the silence on the rolling grasslands bordering the Pantano Wash. As the steel rails neared the last flat piece of land before the tracks would follow the old wagon road into the Cienega Creek bed, the landscape merged into succeeding layers of marshland that supported tall, native grasses that bent to the will of the wind. The Southern Pacific Railroad had entered Tucson the month before on March 20, 1880. A siding was needed; a spur track built out from and alongside the main line, so that east and west bound trains could pass. The flat place in section 16 would do. The tracks between Vail’s siding and Dragoon Summit to the east would prove to be the most expensive and difficult to build and maintain along the entire route through southern Arizona . As workers entered the Cienega Creek Bed, they had to undertake a considerable amount of excavation and build stone supports across the marshy ground. The Western Union Telegraph line was installed simultaneously alongside the tracks enabling updates to be sent back to those monitoring their progress. This marvel of technology would establish more firmly the United States westward expansion and perception of accomplishment. Surveyors sighting the route were not familiar with the region’s intense, unpredictable, seasonal flooding. Wash-outs causing schedule hold-ups would plague this section of the main line, two in 1880 alone. The initial 1880 rail work of the Chinese workers would be repaired, cribbed , and finally re-routed in 1888 when the tracks were brought out of the creek bed by another crew of 1,000 Chinese rail workers. Ranching and mining brought the hope of prosperity to those living along the tracks and to Punta de Agua, where Cienega Creek and the Pantano Wash meet. As early as 1861 Raphael Pumpelley, an Italian geologist, was sent to survey copper and silver deposits in the Santa Rita Mountains. In 1865, Pinckney Tully and Estevan Ochoa mined, smelted, then hauled 5,000 pounds of copper out of the Santa Ritas to Tucson creating quite a stir. Their find led to further mineral development in the region. Copper became an especially valuable commodity in the 1880s and ‘90s when Thomas Edison improved the light bulb and utility companies began to string copper wire across the country. The price spiked and copper mining became very profitable. station by the mine company. Tucson necessarily losing by the loss of freighting. A road was needed to transport ore to where it could be shipped to Globe, Arizona for processing. When the Pima County Board of Supervisors failed to act in a timely manner the Helvetia Mining Company spent $10,000.00 of company funds to build a wagon road to the closest rail point. That 17 mile-long road led to Vail’s siding. Vail became the break of bulk point for mining and ranching from the Rincon Mountains south to the Santa Rita Mountains. Between 1895 and about 1914, Vail’s siding was a beehive of activity. Materials were transferred from lumbering freight wagons to designated ore dumps along a rail spur installed by the Southern Pacific Railroad . The spur-track’s building cost was charged to SPRR Construction & Improvement, the cost was $800.00. Shipping charges from the busy siding would more than recoup its cost. The transfer of copper ore from freight wagons to ore dumps to railroad cars required large numbers of men. Mining as well as ranching provided jobs and business opportunities. Teamsters and laborers, wranglers, and those fleeing unrest to the south in Mexico were drawn to the area to fill the need. Three small graves in Rancho del Lago dating to the turn of the last century belong to this new group of community members. Mera and Edna Harris and Lillian Lively were daughters of teamsters who hauled ore from Helvetia to Vail’s siding . Felipe and Delphina Bejarano escaped Mexico with only hours to spare before settling and raising a family in the area. Like many during this time they lived where the work was; Rosemont, 49 Mining Camp, Pantano, Vail, and later, Tucson. The Helvetia Copper Company was located in the Santa Rita Mountains, near present day Corona de Tucson and southwest of Vail. In 1899, the 17-mile freight road was completed and a new 200-ton stamp mill, needed to crush the valuable copper ore, was trackside at Vail’s siding waiting to be transported. It was sent over the new wagon road. The Helvetia mine supported a booming community totaling nearly 500. For a short time Helvetia had the largest school in Pima County with about 100 students. Twenty seven other copper claims were being worked nearby. Freight wagons pulled by twelve horse teams loaded with 20,000 to 30,000 pounds of ore made the trip each day to Vail’s siding. The Helvetia-Vail wagon road was the forerunner of our present-day Wentworth Road . Investors, businessmen and miners needed transportation to outlying camps and towns. The Tucson to Helvetia Stage Line transported passengers and mail daily between Tucson and Helvetia. Vail’s siding was midway and a stop for the Tucson to Helvetia Stage Line. Carter Crane and John Fraker were proving up on their homesteads near Vail’s Station. They operated the Vail Livery located on the west side of the Vail Store. They provided food, water, and a change of horses for the final leg of the trip. Their farming operation supplied feed for both ends of the stage line. Crane and Fraker grew barley and hay crops at the La Cienega Ranch. Their farming operations were irrigated by water channeled from Cienega Creek. Their farm is now known as Rancho del Lago. Ranch there is in Southern Arizona. Nearest Office to the proposed one is Pantano, 9 miles to the east. Tucson 20 miles in a westerly direction. Greaterville is 23 miles in a southerly direction. 1 mile from Cienega Creek. [water] Will be supplied from SPRR. 25 feet north of the track in Vail. On November 27, 1900, Harry Alvin Man, proposed postmaster for Vail, A.T., signed the Location Paper for J.H. Brislow, the Fourth Assistant Postmaster General. Checking the mail would no longer involve a nine mile trip to the town of Pantano for residents around Vail’s Station. Vail was now linked to the national “mail by rail” network. First by a wooden “F” crane and later, when a second track was built in 1912 by the Southwestern & El Paso Railroad, two metal mail cranes, one by each track, were used to hold outgoing mail. The canvas mail bag used by the Rail Post Office (RPO) had a leather belt that cinched in the middle with a metal ring on either end. Minutes before a train was scheduled to pass through Vail, the mail bag would be attached to the arms of the “F” Crane by the ring at each end. A postal worker aboard the passing rail car extended a long metal pole with a hook at one end to snag the bag. A mail clerk would quickly throw a bag of incoming mail from the moving train. RPO mail bags were able to withstand being thrown off a train at 60 miles per hour . Until 1967, about 90-percent of mail was processed and moved across the nation by rail. It could be a tricky business and timing was critical. A mail hook extended at the wrong time from a passing train could snag a telegraph pole or line instead of a mail bag. A timid toss resulted in a snowstorm of correspondence as the bag was drawn under the train’s wheels. Clerks became so familiar with their route that they could ‘feel’ their next pick up spot, even at night . In 1882, the Arizona Territory became part of the postal “mail by rail” system with the designation of the Deming & Los Angeles RPO. The route was later lengthened to include San Francisco. Moving at speeds of between 23 and 32 miles per hour, a distance of 1,198 miles was covered while mail clerks processed the mail on SPRR trains 19 and 20 on board the swaying RPO rail cars that passed through Vail’s Station. This center of commerce and communication for the area surrounding Vail has witnessed stories of commerce, confrontation, joy, hope, despair, death, and the everyday life of ordinary people who passed through its doors every day for over 100 years. Some of the people associated with the building were flamboyant, energetic and left a lasting mark while others led quiet lives that are hard to trace. There were even a few memorable pets. Early homesteading families like the Leons, Bravos, Estradas, Johnsons, Contzins and Millers collected their mail in the adobe post office and store. They were also working as wranglers, miners, railroad workers, and ranchers, whatever it took to make a living. Others who picked up their mail at the adobe post office included an Apache named Naicho , who claimed to have ridden with Geronimo and his son Gabrielle, who ran goats along Cienega Creek. Ned, a Buffalo Soldier whose first name only has been passed down by word of mouth and WWII Medal of Honor awardee Audie Murphy who drove from his Ocotillo Ranch near present day Corona de Tucson. They were all connected with the outside world and far away loved ones through the Vail General Store and Post Office. In 1901, the United States Post Office designated the Southern Pacific Railroad Passenger Station at Vail as a location for the United States Postal Service to receive and deliver mail. Southern Pacific Railroad agent, Harry A. Man, became Vail’s first Postmaster. He had been transferred to Vail’s Station from the town of Pantano when the SPRR built a Passenger Station at Vail in 1900. Man, like so many others in the Territory of Arizona was involved in multiple business ventures. He formed the Empire Valley Mining Company and served as its president in addition to his duties as SPRR agent and Vail postmaster. His family was firmly rooted in the area. and Miss Hattie Man, daughter of Mr. Inside the original store and post office, a bar was operated by D.C. Cage. It was the local ‘watering hole’ for off-duty railroad crews as well as wranglers, miners, homesteaders and travelers. He had multiple mining claims in addition to his business venture inside the General Store at Vail’s Station. Henry Dowdle was a prominent citizen in Vail, Tucson, the Santa Rita Mountains, and later the Gila Valley. Sawmill Canyon in the Santa Rita Mountains was originally called Dowdle Canyon in recognition of the family ranch in the area. In about 1903, Dowdle purchased a ranch from the Vails along the Cienega and began operating the General Store in Vail. Dowdle sold his business interests in 1905 to Otto Schley and moved to the Gila Valley to ranch. Henry Dowdle later helped organize the Bank of Safford, served as Graham County Recorder, county supervisor twice, and established a school in Safford . Dowdle family members have pleasant memories of their time in Vail including the exploration of Colossal Cave where they used string to mark their route. Vail’s second postmaster, Otto Schley, operated a store, bar, and multiple mining claims, including a bat guano mining operation at Colossal Cave with friend and Mountain Springs Ranch owner, William Shaw. An enterprising individual, Schley raised venture capital and operated a mercantile to the south at Cuprite . He also was a business partner of the Helvetia Mining Company in the Santa Rita Mountains. He cut a dapper figure and wore a fashionable straw boater hat. Schley did not skimp when it came to business or equipment. In business the perception of success is important. His National Cash Register, ordered in 1907 , had every ‘bell and whistle’ available including a custom brass nameplate reading Otto Schley & Co.
Schley emigrated from Germany in the late 1880s and probably lived in New York and New Jersey before heading west. Continually on the lookout for promising business ventures, his partners included J.B. Anderson, a manager for the Helvetia Mining Company and who was the Pima County representative to the Fifth Arizona Territorial Legislature in 1870. Otto also counted among his friends father and son Henry and Albert Buehman, prominent photographers in Tucson. Schley’s frequent comings and goings between Tucson and Vail’s Station — “where he is engaged in business” — and, where — “…things were going along in the same old way at his place” — were often noted in the Arizona Daily Star and Tucson Citizen. Early Tucson pioneer Sam Hughes described this type of individual as having “a spoon in every soup.” Otto fit that description to a “T”. cake, I enjoyed it immensely, as also did I your letter. 12 miles, but now I am O.K. Will close now, but will write again soon, also to Willis. Love to all. Four years later in 1906 Otto married Mrs. Sarah Eveleen Field Rae, “Evie”, in the downtown Tucson living room of friend and business partner, Henry Buehman. Henry’s son Albert Buehman served as best man. Jessie Rae, Evie’s daughter, was flower girl. A parlor decorated with oleander and pepper boughs made their guests feel welcome. Among those in attendance were J.B. Anderson, his Helvetia business partner, and his wife . Otto Schley was active in the Vail community and the region. He served as a Democratic delegate to the Pima County Convention and in 1906 served as Clerk of the Vail School Board . Schley’s mining interests ranged throughout the Empire and Helvetia mining districts. He operated camp stores, raised venture capital back east in New Jersey and New York, and held many mining claims himself. He is listed in the April 23, 1906 Tucson Daily Citizen as a contributor to the San Francisco Earthquake relief fund . On May 21, 1908, the night disaster struck, Otto was in Tucson for the Democratic convention where delegates would be selected for the Territorial Legislature. Orange flames rose high into the starlit sky, crackling and hissing as they consumed the dry planks of the board and batten building that housed the Otto Schley & Co General Store and Post Office. Asleep inside, clerk Andrew Duffy narrowly escaped with his life. Fleeing the fire, he grabbed the ledger book and managed to save the new 200-pound cash register. It had been a special order and was only about a year old. Mr. Duffy had no idea how he had managed to save the heavy register, as a few moments later he could not pick up more than a few pounds. Southern Pacific Railroad employees pulled a long canvas hose attached to the SP water tank car southward toward the burning building. They were hoping to extinguish the flames 300 feet to the south. The hose would not reach. A message was quickly telegraphed to Schley in Tucson. He raced back along the Old Wagon Road, making it in only an hour, half the normal time. Smoldering ashes where his thriving business had been greeted him. Otto had insurance on the contents of his store. By his estimation there had been between $10,000 and $12,000 in merchandise inside when it burned . An optimist, Schley declared the very next day that he would rebuild, and “this time it would be of brick.” Only $6,000 would be covered by his insurance policy. Fire from an unknown origin destroyed the big store of Otto W.H.Schley late yesterday afternoon at Vails station. Mr. Schley at the time was in Tucson attending the Democratic county convention as a delegate from Vails. was done, but it was without avail and the store with all of the goods placed there was destroyed. The Schley store was one of the largest of the country stores in this section as [V]ails is a trading point for the Helvetia camp. An effort was made today to reach Vails by telephone but this was impossible as the fire temporarily put the telephone wires to that place out of business. It is reported here that Mr. Schley carried some insurance on his property but the amount could not be learned. On May 27, 1908, he said he would “…begin operations following the settlement of insurance matters. ” Rising from the ashes of the fire, the store was open for business by August. Constructed of adobe bricks, stone rubble, shipping crates marked Vail A.T. (Arizona Territory), and salvaged material from the original store to include wood for trusses. Probably the only store-bought items were the windows, nails and hinges. residence for Otto Schley at Vail. By August of 1908, Otto and his wife Evie had moved into their new home in Vail. Built at the same time as the new store, it was located on the north side of the tracks between Vail’s passenger station and the local school. They called it Casa Blanca. A white picket fence surrounded the comfortable lime plastered home. A garden and small barn constructed from railroad ties were nearby. Otto and Evie split their time between a fine red brick Victorian house in Tucson and Casa Blanca at Vail. Schley hired Mr. Charles Whitehead, a well-known contractor , for the job. Otto’s business partnership with the Helvetia Mining Company and several of the company’s managers led to a dispute involving the land the store and post office were built on. The dispute ended up in court. Otto and business partners F. B. Close and J.B. Anderson, Helvetia Mine managers, along with the Helvetia Mining Company had co-leased the land from the Pima County Board of Supervisors. There was a falling out about the direction the business should take and their partnership broke up. Otto continued doing business on the property in the building he had constructed for Otto Schley & Co. General Store. Without Otto’s knowledge Mr. Close had taken out a second lease for the Helvetia Mining Company and left him out. The land that the store and the Schley’s new home, Casa Blanca, were built on were now leased to the Helvetia Mining Company from the Pima County Board of Supervisors and belonged to the Vail School District. The situation had festered for several years before making it into the courtroom of Judge Campbell in Tucson. The attorney for defendant Mr. Close, manager of the Helvetia Mining Company, put forth that the reason for the suit was that Otto had interfered with the business intentions of the mining company and they had taken steps to “oust him.” He alleged that was the reason for the suit. The jury was already in deliberations when the judge threw out the case . The controversy between Schley, Close, and the Helvetia Mining Company over the possession of the valuable property involved the Vail School District since it was located in section 16 of Range 16 Township 16. Section 16 is typically set aside for schools. After the Pima County Court ruling, the case was not over. The outcome gave the Helvetia Mining Company the power to force Schley out. Otto was not going to be ousted from the business and buildings he had invested in without a fight . He and his wife continued to operate the Otto Schley & Company General Store and Post Office in Vail. The case went all the way to the District Nine Court of Appeals in San Francisco which upheld the lower court’s decision. The stress of the process and dealings with his former business partners was keenly felt by Schley. Otto was found dead on the floor of the adobe store and post office in 1914, presumably of a heart attack. He was 44 years old. Andrew Duffy is listed as both Postmaster and as mail clerk. His quarters were in the Otto Schley & Company General Store in Vail. He worked for the Southern Pacific Railroad as an Express and Telegraph Agent and also for Otto Schley & Co. It was Duffy who was asleep inside the original store when it burned. His quick actions saved the ledger book and 200-pound cash register from being consumed by the fire. Sarah Eveleen “Evie” Rae Schley arrived in Arizona in 1900 from New Jersey with her husband George Rae, who was ill with tuberculosis, and their daughter Jessie. Their wagon was loaded with all their worldly goods. They were hoping for improved health and a fresh start. They had interests in the Cuprite Mine and lived in the camp for a time. George was an accountant and practiced his profession in Tucson until his death in 1903. Evie returned to New Jersey to bury her deceased husband and remained there for some time. She returned to Tucson and later married Otto Schley in 1906. Evie, as she was called, operated Vail’s general store until 1929 and served as postmistress off and on. Her comings and goings between her homes in Tucson and Vail are noted in the newspapers of the day. Evie even took her children to see the flying airship that made a visit to Tucson in February 1910 and to Catalina Island in California. Life became more difficult after Otto’s death in 1914. While gardening one day in her fenced garden next to Casa Blanca, Evie’s life was saved by Bud, her pet bulldog. Confronted by a poisonous five-foot long rattlesnake, her path of escape was blocked. Bud placed himself between the reptile and his mistress. In defending her, he was bitten three times on the nose. Evie rushed him to the vet and Bud fully recovered. Evie’s daughter, Jessie Rae, fell in love with and married Guy Monthan (Tattersfield) in 1919 after her graduation from the University of Arizona. They may have first met at the Vail Store and Post Office. His parents, Jeremiah Tattersfield and Alma Monthan Tattersfield, had moved the family to Vail in about 1902 from England via Calgary. They homesteaded and purchased land and worked hard to create a successful farm, nursery, and orchard operation near Punta de Agua, where the Cienega Creek and Pantano Wash meet. They renamed the former La Cienega Ranch, about a mile southeast of Vail, Rancho del Lago. There were five handsome sons at the ranch: Harold (d. c1908), Eric, Guy, Carl and Oscar. Two, Guy and Carl, would marry the daughters of Vail postmasters. In 1917, their mother, Alma Monthan Tattersfield, marched them down to the Pima County Courthouse and had all of their last names changed to Monthan, her maiden name. All of the Monthan/Tattersfield surviving sons except Guy served in WWI. He “drew the short straw” and stayed to help their mother with the family operations at Rancho del Lago. Davis-Monthan Air Force Base in Tucson is partially named for son Oscar Monthan. He served in World War I, becoming a pilot in the Army Air Corps. Oscar visited Vail often bringing his friend Billy Mitchell with him. Later General Mitchell would claim to have caught 400 fish in the well-stocked lake that the Monthan/Tattersfield family had created by channeling the water from Cienega Creek. In 1924, Oscar was killed in an airplane accident at Luke Field in Hawaii . In 1927, the new airport in Tucson was named Davis-Monthan, in honor of Lt. Oscar Monthan and Lt. Samuel Howard Davis, another soldier from the region, who was killed while on active duty . Guy and Jessie lived in Vail until their sons reached school age. Evie loved to cook and sew for her grandsons George and Guy who helped their grandmother get the mailbag ready for the train. She would reward them with a bottle of Delaware Punch soda pop from the ice box of the Otto Schley & Co. General Store. Evie worked hard to make sure her children, Jessie and Paul, both had the opportunity to attend the University of Arizona. She is remembered as being very kind and soft-spoken by Belin Lopez, who picked up her family’s mail during the 1920s. She recalls gazing longingly at the long, flat lengths of gum and candies in the hand-crafted merchandise case on top of the wooden counter. Evie resigned on July 15, 1929 . Kruse Davis, a Southern Pacific Railroad agent and telegraph operator, began his duties as Vail Postmaster on October 18, 1917. There had been a delay in his appointment and he had written Arizona Congressman Carl Hayden to intervene on his behalf. In a letter dated September 14, 1917, Hayden replied that the “First Assistant Postmaster General…promised me that prompt attention would be given to this matter…” His appointment came through in October. In about 1928, Davis was transferred to Tombstone where he served as the Southern Pacific Agent until 1941. He and wife Ida Florence had four children, Brooks, Kruse Jr., Rodger, and Mary, who grew up in Vail. Mary Davis, the postmaster’s daughter, fell in love with Carl Monthan. They married a few years after he returned from serving in World War I. Each brother had his own house at Rancho del Lago; Carl and Mary made their home in his. Carl and Mary later moved to Tucson where they owned and operated the Southwest Nursery for many years in the Menlo Park area on the city’s west side. Dovie Woolsey was born into a well-to-do family in Arkansas. With a beautiful singing voice and other talents that included dancing, acting, and playing the piano, she had dreams of performing on stage. She ran away with a traveling theatre troupe at about the age of 17, hoping to make it to Broadway. Two marriages and four children later, she was traveling west along a dusty stretch of U.S. Highway 80. The lumbering sedan was loaded with all of the family’s earthly possessions. Her husband had tuberculosis, and, like many others, they had hopes of finding a better climate and a fresh start. On a Sunday in 1929, a weary Dovie Woolsey and her family met Mrs. Caroline Beach. The Woolsey family had run out of gas in front of Vail’s Home Store and Post Office . Mrs. Beach was the wife of a prominent rancher in the area. In 1935, she built the Shrine of St. Rita in the Desert Catholic Church in memory of her first husband, Jokichi Takamime, for the rural population of Vail. Caroline Beach discovered that Dovie played the piano and had a lovely singing voice. She told Dovie about the vacant postmaster position that would provide housing for the family as well. Caroline convinced her to stay in Vail and play for the small Catholic congregation meeting at the Vail School. Dovie and her family stayed; she became Vail’s ninth postmistress. Caroline gifted her with a piano that would remain in the building until it was sold in 1973. Dovie’s husband, James, was a writer and though practically an invalid, contributed articles to the Arizona Daily Star under the pen name “Rincon Recluse”. He died a few years later in the small northeast room of the store and post office. The sound of his persistent cough created an indelible memory in the mind of his youngest son, Ed . Mary Jane is remembered fondly by the community that she served for 39 years. Mary Jane’s mother was Dovie Woolsey, Vail’s postmistress. Dovie became ill with cancer in 1933 and wrote her daughter asking for help. Mary Jane left a promising position as an executive secretary for an Oklahoma City car dealership. The young woman from the city could never have envisioned the direction her life would take. She moved in with the family and began helping with the work. Dovie told her daughter Mary Jane that, “With every three cent stamp sold, we get thirty minutes entertainment.” Dovie died on April 21, 1934, about six months after her daughter arrived. Mary Jane was left to care for her three younger siblings and a country store and post office. With the encouragement of Caroline Beach, Mary Jane decided to stay. She was appointed temporary postmistress of Vail in 1934. Another potential candidate, or “eligible”, wanted the position and was not going to give up easily. Mr. George Allen was a loyal Democrat and active member of the local Democratic Party. He had invested a great deal of time working on Mrs. Greenway’s Congressional campaign. It was 1934 and the Great Depression was in full force. Mr. Allen had been out of work for three years. Allen hoped that his and his son’s work for Greenway’s campaign and their loyalty to the Democratic Party might tip the decision in his direction. Within days of Dovie’s death, the correspondence and campaign for her position began. On April 24th, Isabella Greenway had already sent a response to the head of the local Democratic Party in Tucson, Mr. Leslie C. Hardy whose office was in the impressive Consolidated National Bank building in downtown Tucson. There was a rule relating to residency stating that a postmaster’s home address must lie within the delivery area of the post office they would be serving. This rule became the deciding factor. George Allen alleged that Mary Jane was from Oklahoma. Mrs. Beach, who had been a great friend to Mary Jane’s mother, Dovie, wanted Mary Jane to become Vail’s permanent postmistress. She wrote to Arizona Congresswoman Isabelle Greenway who became actively involved in the process of Mary Jane’s appointment. Tucson’s Democratic Party chair, Leslie Hardy, and Congresswoman Greenway corresponded about the situation. She said that Mary Jane had been “living in Vail for the past six months. It shouldn’t really matter where she was from before that.” The story is told within the lines from letters that passed between Congresswoman Greenway, Leslie Hardy, Caroline Beach, and Mr. George Allen–who wanted the position in Vail, as well as Postmistress Dovie Woolsey’s daughter–Mary Jane Warner. After another courtesy communication with the Pima County Democratic Central Committee Chairman, Leslie Hardy, Mrs. Greenway sent her recommendation to the Acting First Assistant Postmaster General, V.C. Burke in May of 1934. A few months later Mary Jane sent a hand-written note to Mrs. Greenway. Just a few lines to thank you very much for the lovely message and for both you[r] help and your sympathy. I should have written sooner but am very busy with my newly acquired family. Have heard nothing definite yet about the Post office but I feel sure I will get it with your kind help. I certainly hope I do my work here as it should be done and to the satisfaction of everyone concerned. Mr. George Allen continued to hope the position would be his, but he received a letter from the Congresswoman’s office dated August 31, 1934 explaining, “…I hope this clears up the matter of residence requirements which make it impossible for me to give your application the consideration I otherwise would have.” In the end Mrs. Beach had her way–as she usually did. In September of 1934, Mary Jane received official confirmation. She stayed and became Vail’s longest serving postmistress. Mary Jane lived in the three small rooms at the east end of the adobe with her brothers Bud, Ed, and sister Betty. They were visited every year by Mary Jane’s other sister, Jacqueline. From the time Jacqueline was seven years old, she would be entrusted to the conductor, a family friend, and ride the mail train from San Bernardino to Vail to visit. On her first visit her luggage included her violin which Mary Jane had asked her to bring. Seven year old Jacqueline would give her very first public performance for the Christmas celebration at the Shrine of St. Rita. She played Christmas carols for the parishioners, seated at tables covered by red and white checkered tablecloths and made from long boards that rested on saw horses. They had gathered together to worship and enjoy a holiday potluck. The last song, Silent Night, brought a hush to the crowd. Their response encouraged the little girl to share a lifetime of musical talent playing for an orchestra. Bud, the oldest son orphaned by Postmistress Dovie’s death, was 16 and soon joined the Civilian Conservation Corps (CCC). He served at Colossal Cave and was a favorite of Frank and Evelyne Schmidt, the operators of the cave. From 1934-1937, the Vail Post Office was where CCC Camp SP-10-A enrollees picked up their mail. Mary Jane was a bit of a flirt. Her quick smile and friendliness made the job of picking up the mail for the camp an enjoyable one. During those economically challenging times, the CCC personnel shared food and other resources with the new postmistress at Vail. Mary Jane’s husband, Everett Warner, also found work with the CCC at Colossal Cave. Warner had a mercurial temperament and returned to Oklahoma after a short time. Mary Jane never remarried. Betty often had friends over to visit and wanted to spruce things up a bit in the adobe building. There was a stubborn stain on the wall leading from the store-post office into the living quarters. The stain wouldn’t come off despite repeated washings. She thought a fresh coat of paint was the solution, but as the paint dried, the dark stain stubbornly began to show itself again. It was puzzling. The family began asking customers if they knew anything about the dark stain on the wall. Finally, like the stain appearing through fresh paint, a story began to emerge in whispered conversations over the long wooden bar that ran half the length of the main room. Cattle was big business in southern Arizona; and rustling, even to feed a hungry family, was a matter that was often settled at the wrong end of a gun. According to local lore, a suspected rustler had stopped by the Vail General Store where he was confronted by wranglers from an area ranch who assumed he had taken one of their steers. An argument ensued and accusations were made. When the suspected rustler attempted to leave, a shot rang out. The man slammed against the white, lime-plastered wall. He slowly slid down to the floor, leaving a dark stain to bear witness. Life was hard in the Arizona Territory. Justice meted out on the range was even harder. In the end, it took a coat of new plaster to cover the stain and silence the story. Did this really happen? If walls could speak, we would know for sure. Betty Woolsey, the middle child orphaned by Dovie’s death, soon graduated from the eighth grade at the Vail School and moved to Tucson so she could attend Tucson High School. Ed, the youngest brother, was still in elementary school. He continued to help his sister Mary Jane with the mail and running the store until he was 15. With $1.60 in his pocket and only the clothes on his back, he moved to Los Angeles to attend high school and play football. Ed’s recruitment for the football team at East Los Angeles High School was helped along by his dog Ring and a Vail schoolteacher. Mr. Van Dorn had told him that education would be the way to a better life. Ed could accomplish that through sharpening his athletic skills. Mr. Van Dorn sewed the leather tongue from an old boot to a football and told Ed to practice throwing and kicking the ball. It could be retrieved by Ring via the “tongue”. Every day after school Ed would spend an hour or two practicing with the unusual football behind the adobe store and post office where he lived. Ring was a Flanders cattle dog purchased back east by Rincon Valley Rancher Rukin Jelks. Injuries after being attacked by coyotes had left Ring nearly deaf and blind. He was a favorite of Mr. Jelks and had been taken to a vet and nursed back to health. He would never be the working cattle dog he had been, but he could still be a good watchdog and companion. Jelks gave him to Mary Jane and made sure that a 50 lb. bag of dog food was dropped off every month. 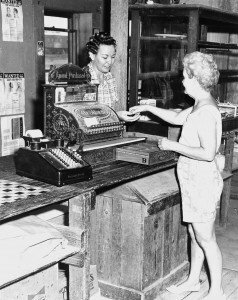 Ring’s favorite spot was near the cash register at the west end of the long wooden bar. He could hear the floor boards creak and feel vibrations as customers entered. He would walk to the entrance of the living quarters at the east end of the building to alert Mary Jane and Ed. With Ring’s help, Ed had the opportunity to finish high school, earn a scholarship, go on to college, and become a successful businessman. Mary Jane didn’t make many changes inside the adobe building. Dovie’s piano still stood against the west wall in the small apartment. Meals were cooked on a small, pot-bellied railroad stove next to the narrow built-in pantry. Dishes were washed in a tin washbasin on a wooden table under the window with a beautiful view of Mount Fagan to the south. Water was carried from a Southern Pacific Railroad tanker car. She slept in the southeastern bedroom and didn’t seem to mind the bats that lived under the eaves. In her earliest days of living in the building, Mary Jane was a bit more squeamish. She would make her younger siblings take flashlights and look carefully under the beds and other furniture for scorpions and spiders before they could go to sleep! December 7, 1941, was a watershed for the nation. It also touched lives in Vail. Fred Mayor was 11 years old and playing marbles when everyone started talking about the Japanese attack on Pearl Harbor. It was hard to understand what was happening. Fred’s favorite uncle, Ben Estrada, decided to enlist. Mary Jane was his girlfriend and he must have stopped by to say goodbye. He left to serve in January of 1942. Many letters were posted and received at the Old Vail Post Office between Ben, his Mother and Mary Jane. Just before Christmas of 1942 Mary Jane placed a call from the Vail Post Office, one of a very few in the area, to the Estrada family to tell them that a telegram had arrived. The family quickly loaded into their ’31 Chevy and left for Vail. A tearful Mary Jane came out of the building before they could get out of their car. When she hugged Ben’s mother, the children knew what had happened. Ben had been killed in action, a long way from home, in the Battle of Burma on December 16, 1942 . After Pearl Harbor Jack Herman, the grandson of ‘Pop’ Schmidt operator of Colossal Cave, enlisted. He and girlfriend, Jane Dillon began talking about getting married before he shipped out. They decided to get married in Florence to keep it a secret. A Justice of the Peace officiated on May 13, 1942. A few friends made the trip to Florence with them. When a girlfriend’s mother found out she wanted to let Jane’s parents know right away. The Dillon’s Texaco gas station didn’t have a telephone, but the Vail Post Office did. Postmistress Mary Jane Warner was asked if she would please go over and tell them that “Jack and Jane had just gotten married.” Their marriage lasted 65 years. Many of the local school children helped Postmistress Mary Jane Warner with the mail. Miguel Escalante, George Monthan, Jim Matthews, Jim Smith and others remember either attaching it to the crane or bringing her the mail bag that had been tossed rail side. Many fond community memories are attached to these tasks. Max Allen relates how on one hot afternoon he and a friend were given the job of the mail hand-off. They had a bag of packages and were supposed to toss it through the open door of the rail car as the train slowed and passed by. The mail clerks aboard the train had opened the doors on both sides of the train to cool things off inside. The young men, thinking it would be great to have the train stop in Vail that day, tossed the bag just hard enough to pass through both open doors, much to the dismay of the mail clerks and train engineer. The train made a quick, unscheduled stop. Ruth served as substitute postmistress on a regular basis during the 1950s when Mary Jane went on vacation. The Matthews had moved to the Vail area in the 1930s and operated a gas station where Highway 80 and Colossal Cave Road met. Mr. Matthews worked at the Colossal Cave Civilian Conservation Corps Camp. Ruth became a very good friend of Mary Jane. With seven children to care, for the extra income would have been welcome. When son Jim Matthews married in the early 1950s, Mary Jane made a place for him and his wife in the small living quarters at the east end of the building until Jim found work and they could afford a place of their own. Mary Jane Warner became Vail’s longest serving postmistress. She loved visiting with friends, a strong drink, and playing cards on Saturday nights. Community members remember her smile, quick humor, and practical ways. A member and clerk of the Vail School Board for 20 years, she was especially proud of two things — the school buses that replaced parents making the rounds and picking up students and the new red brick Vail school on Colossal Cave Road. Mary Jane attended the Catalina Methodist Church in Tucson and looked forward to visits from her youngest half-sister Jacqueline. Pets were always a part of story of the store and post office in Vail. Mary Jane never went long without a dog or cat to spoil, sometimes two. Prince, a dog given to Mary Jane by the Figueroa family shared the Post Office with Ring for a time in the 1930s. A large scruffy dog ruled the roost and kept postal customers on their toes in the ‘60s. Happy the poodle was the last “postal pet” in the Vail Store and Post Office when it closed in 1973. Mary Jane dreamed of traveling after her retirement, and she did. She was Vail’s postmistress for 39 years. Arthur and Mary Jane Kelley packed up their children and headed west from Michigan in 1967. They settled in the Rincon Valley along Old Spanish Trail next to the white and green Rocking K barn. They attended the Shrine of St. Rita in the Desert and were introduced to Mr. John Curry by Fr Vincent Putzer. Mr. Curry owned the old store and post office in Vail which was empty and up for sale. Arthur and Mary Jane Kelley partnered with John and Ralph Webb to purchase it in 1975 and began operating a feed and general store. The building continued its role as a gathering point for the community. Arthur and Mary Jane along with some of their children lived next to the store in a small adobe house that had been built in 1935 by Charles and Caroline Beach for Matea Flores. A local midwife, she also worked as a housekeeper for the Beaches and for the resident priest at the Shrine of St. Rita in the Desert. This home was enlarged and remodeled by Mary Jane Kelley’s children as a surprise when she went to visit her daughter Cathy in Hawaii after their father died in 1991. Two of the Kelley children, Patty and Chauncey, had bedrooms in the east end of the adobe feed store while they were growing up. During the early 1980s, everyone else may have been watching an episode of “Falcon Crest” on television in the evenings, but Patty and Chauncey Kelley were reading and dodging the bats that roosted in the ceiling of the adobe Vail Feed Store. At one end of the Vail Feed Store was “Art’s Parts”. Local residents would stop by in hopes of finding the one screw or widget they needed to avoid a trip into Tucson. Art Kelley saved an assortment of items in “Prince Albert” tobacco cans lined up neatly on shelves. He created a system utilizing rubber bands and washers to identify the contents of each can. Inside plumbing and running water were never installed in the building. Patty and Chauncey Kelley continued to haul water until 1991 when they drilled a well 612 feet deep between the tracks. A new feed store was constructed in 1992 and the adobe building was then used for storage. The Kelley family began to look at new ways for this old friend to continue its role in the Vail community. The Old Vail Post Office is the only building at the original town site from pre-statehood. A very humble adobe, it alone is left to interpret the early stories of the tiny railroad siding and shipping point called Vail’s siding. In 2006 community members began working with the Kelley family to stabilize, then restore the building and preserve the wealth of local lore associated with it. In 2007 they formed the Vail Preservation Society (VPS). Through the efforts of VPS the building was listed on the National Register in 2011 and is a designated Arizona Centennial Legacy Project. Vail is called “The Town Between the Tracks™.” The original town site is bounded on the north and south by rails and bookended to the east and west by Old Vail Post Office and the Shrine of St. Rita in the Desert. A restored Old Vail Post Office along with the Shrine will provide the rapidly growing community of Vail with a sense place and help more recent residents build a deep connection to their new home. Members of the Vail Preservation Society work to create community connections through local history in the belief that engaging in and a knowledge of local heritage will provide a strong foundation for one of the most rapidly growing communities in Arizona. The train doesn’t stop in Vail anymore. The “F” Cranes are gone and mail is delivered from a storefront in a new strip-mall on the south side of the eastbound rails. But the old Vail Post Office continues to create a sense of place for the town between the tracks. It has connected the greater Vail community since 1908. In Vail, we hope it will continue to be a part of our story for the next 100 years. Fourth Class Post Office stations were/are located on private property. First-class post offices usually operate in government-owned or -rented buildings. The classification system is still in effect today. Vails, Vail’s, Vail’s Siding, Vails siding, Vail’s Station, Vails Station, Vail-they are all the same place. The name of the siding needed for safe railroad operations evolved over time as the community grew and its functions changed. The name reflected its origins and the need for a siding to facilitate east – west train passing and one of the business partners, Walter Vail, who along with J. Vosberg granted an easement to the Southern Pacific Railroad. I have used the different names in the narrative as they relate to specific time periods with the intention of chronicling change and growth. The names appear in historic documents, maps and deeds in all of the above forms. Most of the original furnishings in the Post Office were sold by retiring Post Mistress Mary Jane Warner in 1973 or disappeared while the building stood vacant between 1973 and 1974. One handcrafted wooden merchandise display case remains . It is possible it dates to the construction of the building. Joe Maierhauser, operator at Colossal Cave Mountain Park purchased some items relating to the building’s commercial and postal history. These items are currently at Colossal Cave Mountain Park; one section of metal Post Office boxes set in an oak case crafted by Wayne Moore in 2005, two large metal scales, a telephone and the National Cash register purchased by Otto Schley in 1907. The home built by Otto and Evie Schley in 1908 was used by the Vail School District for many years as a “Teacherage” until it was lost to the expansion and growth of Old Vail Middle School in about 1982. Esta and Lottie Trotter, beloved Vail teachers for many years, lived in the white, lime-plastered adobe home during their tenure from 1929 until the 1950s. “Arizona Statehood Post Office & Postmasters, 1912-1979.” The Heliograph. 1990 Winter Issue. P34-35. Arizona Wildlife, The Territorial Years 1863-1912. Brown, David editor. Phoenix, AZ. Arizona Game and Fish Department. 2009. Barnes, Will C. Arizona Place Names. 1st ed. Vol. VI. Tucson: University of Arizona, 1935. Print. 466. Dike, Sheldon H. The Territorial Post Offices of Arizona. Albuquerque, New Mexico: Dr. Sheldon H. Dike, 1958. 21. Print. Edward Vail Papers. Arizona Historical Society. Tucson, AZ. Empire Ranch Collection. Special Collections. University of Arizona Library. Tucson, AZ. Evie Schley to Mrs. Kitt. Correspondence. February 10, 1933. Arizona Historical Society. Form 1011. Location Paper. Post Office Department. Vail, Pima. Harry A. Man. 26 Feb. 1901. Form 4901. Location Paper. Post Office Department. Vail, Pima. Dovie P. Woolsey. 28 October 1932. Form 4901. Location Paper. Post Office Department. Vail, Pima. R. Mason. 19 March 1916. Garrison, James, James Woodward, Robert Trennert, Susan Wilcox, and James Ayers. Transcontinental Railroading in Arizona 1878-1940. Rep. Phoenix, AZ: Arizona State Parks, 1989. Print. Keane, Melissa, and A. E. Rogge. Gold & Silver Mining in Arizona. Rep. Phoenix, AZ: Arizona State Parks Board, 1992.
contract. Purchases new Stagecoach. Arizona Daily Star. 1903. “Merchant Here.” Arizona Daily Star [Tucson, AZ] 28 May 1908: 5. Print. “Miss Jessie Rae Becomes Bride of Mr. Guy Monthan.” Arizona Daily Star. August 3, 1919. Print. Myrick, David F. Railroads of Arizona vol. I the southern roads. Howell-North Books. Pima County. Deed Book 14. Tucson: Pima County, 1887. Print. Pinto, Robin L. and J.J. Lamb. Voices of Vail Exhibit. Vail: Vail Preservation Society, 2010. Print. Railway Mail Crane. National Postal Museum. Web. 9 Oct. 2011. <http://www.postalmuseum.si.edu/museum/1d_mail_crane.html>. Roskruge, George. “Official Map of Pima County Arizona.” Map. Tucson: Pima County Board of Supervisors, 1893. Print. “Store of O. Schley at Vail Burned.” Arizona Daily Star [Tucson, AZ] 23 May 1908: 8. Print. Smith, Ch. Emory. United States Official Postal Guide. Philadelphia: George F. Lasher, Printer, 1901. Print. 25. Post Office Department. United States Official Postal Guide. Philadelphia, PA. George F. Lasher, Printer. 1901. Post Office Department. United States Official Postal Guide. Philadelphia, PA. George F. Lasher, Printer. 1902. Post Office Map of Arizona. 1921. Arizona Historical Society. Tucson, AZ. Poster Frost Associates, comp. Old Vail Post Office Building Condition Assessment. Rep. Tucson, Arizona 2005: Poster Frost. Print. Randolph, E. Southern Pacific Railroad Work Orders. 26 July 1899. Raw data. Arizona Historical Society Research Library, Tucson. Roskruge, George J. “Official Map of Pima County Arizona.” Map. Arizona Historical Society. Tucson, AZ: Pima County Board of Supervisors, 1893. Print. “Schley-Rae.” Arizona Daily Star [Tucson, AZ] 1 June 1906: 5. Print. Stein, Pat. Homesteading in Arizona 1870-1942. Rep. Phoenix, AZ: Arizona State Parks Board, 1990. “Store of O. Schley at Vail Burned.” Arizona Daily Star. Tucson, AZ. 23 May 1908: 8-8. Print. Vail Post Office Log Books. 1934-1937. 1959. Postal History Foundation. Tucson, Arizona. “Vail postmistress ends 39-year job.” Arizona Daily Star. Tucson, AZ. 30 May 1973:23. Wallace, J. Southern Pacific Railroad Work Orders. MS1277. 13 Oct. 1899. Raw data. Arizona Historical Society, Tucson, AZ. Guide Series. Lake Osweko, Or. La Posta Publications. P27. 1893 Map of Pima County, Arizona. Roskruge, George. Pima County Board of Supervisors. Allen, Maxie. Oral History. 2010. Bejarano, Francisco. Oral History. 2009. Canez, Belin. Oral History. 2009. Daily, Rick. Oral History. 2002, 2011. Davis, Jacqueline. Oral History. 2009. Duncan, Vera. Oral History. 2010. Escalante, Miguel. Oral History. 2011. Haro, Guillermo. Oral History. 2010. Herman, Jack. Oral History. 2010. Hodge, Alex. Oral History. 2011. Kimbal, Charlotte. Oral History. 2005. Kelley, Jonathon. Personal Communication. June 2010. Maierhauser, Joe. Oral History. 2003. Matthews, Jim. Oral History. 2004. Mayer, Fred. Oral History. 2009. Monthan, George. Oral History. 2009. Monthan, Jesse. March 3, 1983. Martha Gore. Arizona Historical Society. P 1-6. Monthan, Margaret. Personal Communication. 2010, 2011. Sundt, Frances Schmidt. Oral History. 2008. Wagner, Ed. Oral History. 2011. Woolsey, Ed. Oral History. 2009. Leon, Oscar. Oral History. 2010. With deep appreciation to Mr. James Ayers without whose help I might have searched a lifetime for the date of the building’s construction. Thank you to Chico Bejarano, Miguel Escalante, Fred Mayer and Max Allen who brought the landscape around Vail to life with their stories during hikes with Elizabeth and I. To all of the Vail Pioneer families who have shared their stories, photographs, advice and comments as well as helped with potlucks and events to bring the Vail community together-I can never thank you all enough. And, to Patty and Chauncey Kelley who want to see this ‘old friend’ continue to provide a sense of place to a rapidly growing Vail. This project would not have been possible without everyone’s encouragement and help. Thank you to Elizabeth Webb, Robin Pinto, Sandy Knowlden, Davita Mueller, Max Allen, Calvin Baker, Pat Egbert, Paul Barnett, David Yubeta, Mike Pena, Andrew Gorski-Vail Preservation Society Board. Charlotte Cushman and the Postal History Foundation; Kate Reeves and Jill McCleary of the Arizona Historical Society, Reba Grandrude for her encouragement, Mr. Dave Devine and the Tucson Corral of the Westerners. And, to my family, for their patience and support; they have traveled dusty roads, hiked, helped with too many tasks to remember, heard the stories, read and re-read drafts, and been blessed to meet many of the Vail Pioneers-thank you. J.J. Lamb is director of the Vail Preservation Society and a 2011 Arizona Culturekeeper. She is interested in how local history can build stronger communities. She has written the National Register nomination for the Old Vail Post Office. As Education Director of Colossal Cave Mountain Park, she developed the Civilian Conservation Corps exhibit in the CCC Museum and co-written a history of the CCC at Colossal Cave. She has collaborated with Robin Pinto and others on The New Deal in Arizona: Connections to Our Historic Landscapes, a heritage tourism map recognized in 2009 with the Governor’s Heritage Preservation Honor Award. In 2010, she and Robin Pinto curated an exhibit for the Arizona Historical Society on the Civilian Conservation Corps in Southern Arizona. She writes local history and community living articles for the Vail Voice newspaper.